[miau] NextGen is always creating video slot games that place you right in the heart of the action. The Hot Roller Slot game is no exception, giving you the feeling you are right in the middle of all that action in downtown Las Vegas. The backdrop is full of those iconic casinos you have seen hundreds of times, and the sounds of the game are just as impressive. 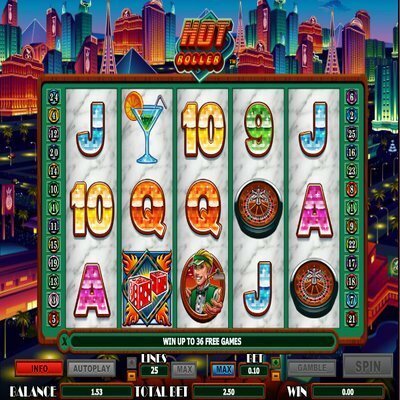 This 5 reel and 25 payline slot machine is the next best thing to driving in your convertible with the windows down as you tool around the strip looking for places to gamble that evening. 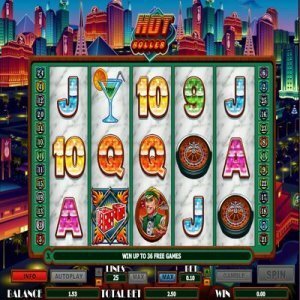 Before you can grab those dice and get rolling with Hot Roller, you have to become familiar with all the unique symbols of this slot game. The basic playing card symbols are all in play here, from the Ace, King, Queen, Jack, Ten, to the Nine. The better paying symbols range from the mixed drink, casino chips, roulette wheel, and finally the dealer. The other symbols in the game are the beautiful blonde player and the dice. Those two are quite unique and can really get you closer to hitting that jackpot in Hot Roller. The wild symbol in Hot Roller is the stunning blonde, and she comes to life each time she is in an active payline by blowing on those dice. The wild symbol substitutes for all other symbols except for the scatter dice. If you are feeling lucky, you might find yourself breaking the bank with the jackpot of 10,000 coins for nailing 5 wilds on a payline. The more times this wild appears on the reels, the faster your bankroll fills up. The most important icon on the reels is of course the scatter symbol. These dice play a huge role in you getting your hands on a boatload of cash. When you have 3 or more scatter dice on the reels, you are sent to the bonus round where you can accumulate a huge number of free spins. While in regular game mode, notice the Hot Roller symbol above the playing field. Each time a scatter lands in the appropriate position on the reels, each letter of the word HOT will burst into flames. Get all three letters on fire, it is off to the bonus round. The bonus round in Hot Roller is very exciting to say the least. Once you are in the bonus round, you are given three dice to throw, two red and a white dice. Throwing the two red dice will allow you to determine how many free spins that you have. If you are feeling lucky, you might be awarded an impressive 36 free spins. The other dice will determine the multiplier for the bonus round. Back in regular play, after every win you have the option to gamble those winnings for a chance to double or quadruple your money.